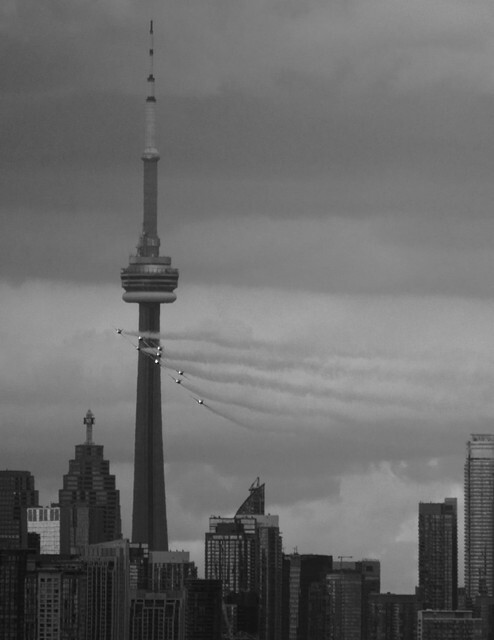 This entry was posted in Challenge, CNE, In the Neighbourhood, Photography, Toronto, weekly photography challenge and tagged Air Show, Cee's Black and White Photo Challenge, city skyline, CN Tower, open topic, photography, planes, vapour trails, zoom lens by Mama Cormier. Bookmark the permalink. Thanks Cee. I’m particularly proud of that shot. Taking photos of an air show is much trickier than I thought but after many unsuccessful attempts I finally figured it out. I’m hoping to post more of my shots later this week.